YOUR MAMAS NOTES: Just before Baby Jesus' birthday last year Your Mama dissed and discussed a 5 bedroom and 6 pooper Balinese-y-contemporary/quasi-Craftsman mansion in Malibu for which 3-time Grammy winning rocker-chick P!nk and professional motocross racer Carey Hart had coughed up a very a-list $11,850,000 a few months earlier. A celebrity real estate snitch whom we call Sherman Oaks told us then that the tatted-up couple would soon put their San Fernando Valley love nest on the market. Two-thirds of a year later, the new Malibuans have pushed their walled and gated Sherman Oaks, CA mini-estate on the open market with a $4,000,000 price tag. Property records show Lady Pink–née Alecia Moore–paid $2,000,000 for the suburban estate in December 2002, long before she hitched her wagon to Mister Hart's motorcycle in 2006. The couple were close to dee-vorce in 2008 but eventually patched things up, bought a big house in the Bu and made a baby. And of course, for rich and famous folks, a bun in the oven makes a new multi-million dollar house as necessary as a $1,200 baby buggy. Listing information shows Lady P!nk's two-story Spanish-style casa, situated in a prime South of Ventura Boulevard 'hood, was originally built in 1946, sits on a flat .69 acre lot, measures a 4,435 square feet and includes 4 bedrooms and 4.25 bathrooms. A quarter bathroom, for the chitlins who don't know, isn't really a bathroom in the bathing sense of the word but rather a facility that contains only a terlit, no sink and no shower or tub. They are often dismal and claustrophobic cubbyholes located in basements, garages and/or services areas. Your Mama's Midwestern besties Chow-Lee and The Laundress have one of these lone terlits in a dark corner of their Minneapolis basement surrounded by a wood-built stall pretty much exactly like in a public restroom. It's more than a wee bit scary to pull your pants down in this compact stall-space but in a house filled with a trio of electrified rugrats who think it's funny to pick the lock on the door the pooper when you're–well–pooping, it's a welcomed haven of dirty bizness privacy. Anyhoo, a concrete, brick and wrought iron wall shaded by thick privacy-making foliage runs across the front of P!nk's property. The double-gated driveway curves tightly in front of the house and leads to antique hand-carved double front doors. The gorgeous doors are probably not original to the house but do lend a smidgen of much needed architectural gravitas to the house, which looks to Your Mama on the inside more like a modern-day suburban mcmansion than a old-timey vintage hacienda. The voluminous impress-the-guests type has a double-height ceiling, staircase with perplexingly paltry wrought iron banister, some sort of stone floor (perhaps it's Travertine? ), and walls bathed in a gawd-awful flesh colored faux suede paint treatment that Your Mama hopes and prays the new owner will change to something less faux and far less corporeal. Lady P!nk and Mister Hart certainly seem to like their faux suede paint treatments as evidenced by the worrisome wound-colored formal dining room lit by a high-glam black crystal chandelier and the tobacco-stained honey-colored formal living room that features near-white wall-to-wall carpeting, a vaulted ceiling with exposed beam and a fireplace flanked by built-in book cases that reach from floor to ceiling and pleasantly enhance the vertical visual experience of the room. Although Your Mama's Big Book of Decorating Dos and Dont's is explicit about faux paint treatments meant to give the walls the textured look of suede: They are to be used only sparingly–if at all–and should always be installed by a faux-paint treatment professional as opposed to a weekend home improvement warrior who thinks they were born with a decorative green thumb. Family and informal entertainment spaces includes a game room with vaulted ceiling, built-in window seat and fireplace with imposing flagstone chimney breast and a carpeted family room with a few built-in book cases and another imposing flagstone chimney breast. The generous gore-may eat-in kitchen is anchored by a Toyota Camry-sized center island with breakfast counter and has white cabinetry with glass-fronted uppers, granite counter tops, commercial-style stainless steel appliances and direct access through French doors to the dining and entertaining terrace that extends off the rear of the residence. 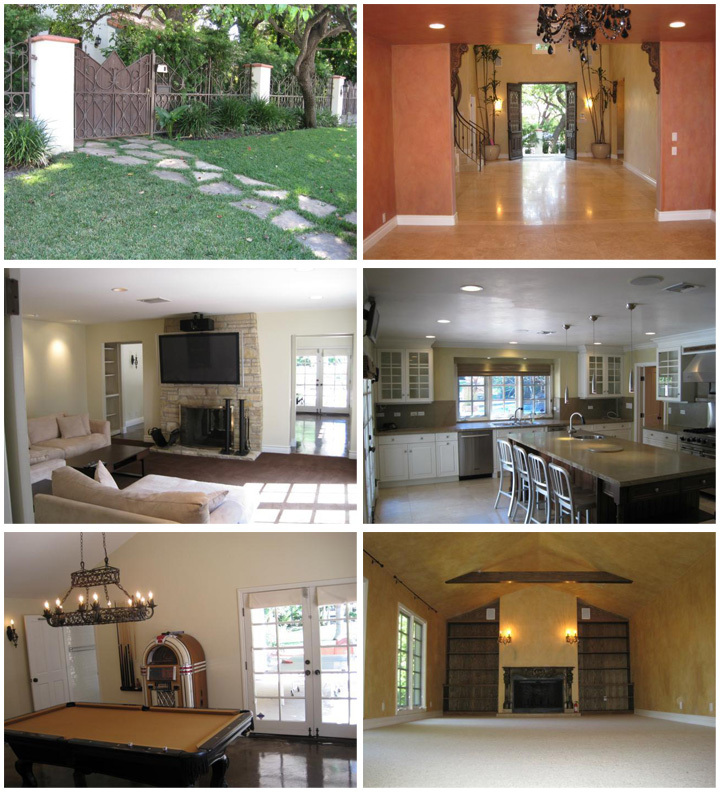 Since the house sits towards the front of the long narrow lot, the thickly planted and (mostly) private backyard seems particularly expansive and includes lots of entertainment amenities that include broad terraces, a covered patio (outfitted with a ping-pong table in listing photos), an angled swimming pool, grotto-style spa, built-in fire pit, built-in barbecue center for year-round grillin' and chillin', and a football field-sized lawn. Although listing photos show much of it has been removed, aerial photos of the house show the grassy area was once dotted with a swing-set, trampoline, and mini half-pipe where the mister and mistress of the house could practice their skateboarding tricks. 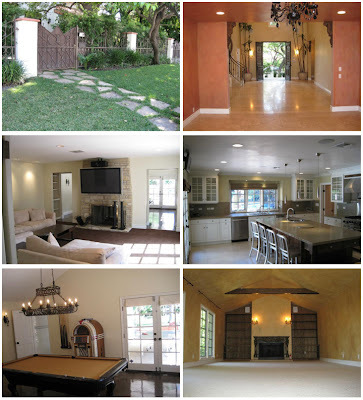 Listing photos show the furnishings (and day-core) are spare and the cabinets empty so clearly Lady P!nk and Mister Hart have completed their move from Sherman Oaks to Malibu where they are frequently photographed around town with baby Willow in tow. OMG. First, the house at its core is nice -- structurally speaking. That said, let me say just a little about the "interior design." Wall-to-wall carpet in some rooms? From The House of P!NK? And here I thought she was "hip." Second, there's the price. $4.0 for 91403? Really? I know the broker wants to make P!nk feel like she is a super star, you know -- just like the cool kids with their $4m plus homes above the Strip. But, this is Sherman Oaks. You know, where TV shows are shot because it looks so ordinary. That's because it is ordinary.Very nice, but nonetheless ordinary. 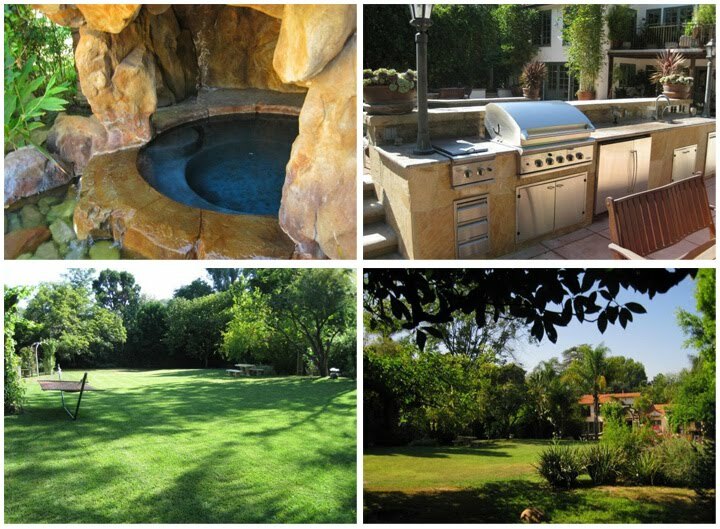 Homes of 4-5k SF on large lots in 91403 range from $1.2 for short-pays, up to $3.0. Unless there's a bonified P!nk fan out there with more money than brains, this house might be slashed by $1.0 before somebody buys it. Might. There is always a potential full-price buyer out there. Here's the profile: under 20 first-time buyer with a fat paycheck from Disney. No need to "decorate." Just set-up the portable B-ball hoop in the driveway, right next to the new X6M. Now your the sh!t. TV's on fireplaces are awful and this ones the worst. It is many times bigger than the fireplace. We can only hope she hired a nice gay decorator for the Bu property. And the holiday lights out back Ughhh..
@ anon 11:32: Co-sign on the TVs on fireplaces assessment. This one is particularly awful. As for $4 million asking price, good luck with that. There's plenty of inventory available at that price. I know I can trust Hippie's eagle eye with regards to bones & provenance (since the decor is so iffy & non-representative) on this 1946 hacienda. It appears to have withstood the "...the heart-ache and the thousand natural shocks that flesh (or in this case architecture) is heir to..." The kitchen shows not only great potential but a hint of past glory, when it was the heart of a 20th century home, updated to a 21st century command center. The yard is lovely, the site roomy & well laid out, and apart from the oddly photographed living room (one suspects the ghost of Lon Cheney, flanked by black candles & slumped over an Aeolian keyboard just our of frame) there is nothing remarkably irredeemable about this house besides the price. If motivated enough (um, say, a 7-figure Malibu mortgage) I would not be surprised to see this go quickly for a hair under $3MM. But please God get rid of that nasty "grotto cave spa"...the 90s are never coming back. what is she going to do when she can only get 400k for it ? declare bankruptcy ? These have to be some of the worst listing pics I've seen. Looks like a ten year old with an old i-phone took the photos. If we look closely enough, I bet we'll find a pair of scuffed white pumps somewhere near the jacuzzi grotto. I'm a well known and active sherman oaks agent. I guarantee you that she won't get more than 3 mill for that. That's at least 25% over price. Ugh, could we please stop calling her "P!nk"? It's irritating, she's not that exciting, and you know who else used to use an exclamation point in their name? That's right, H!tler. Little known fact. Wanted to get noticed when he was young and hungry for fame, just starting out in the genocidal dictator biz. Some snappy punctuation to get noticed. And we all know how that turned out. The outdoor spaces seem quite nice. Does anyone recall a 90's sitcom, perhaps on Showtime, called "Sherman Oaks"? It was short-lived, not great, but I seem to remember it as mildly entertaining and wacky. i really like the exterior part but them interior looks a little messy to me. . .
She doesn't care. She was never sober long enough to notice the poor decor. I suspect things have changed since the baby, so maybe she'll step it up a notch. From what I've seen in interviews though, she's not too anxious to leave her lower middle class Philadelphia roots. We're talking about a girl who used to throw ketamine parties as a teen while her mother was at work. She doesn't put on an image; she's exactly what you see. The white trash girl driving a lawn mower down the street while chugging a beer in her video is the real her. She's proud of where she's come from and isn't anxious to impress. What a hot mess this little house of horrors is. All I can think of now is Pink and her blubber splashing around in that grotesque grotto. I don't know what Carey sees in this one-train-track-away-from-trailer-rash anti-diva. LMAO @ the posts here......omg they are good. My opinion of this pile? YES Lady Smarmalade! "Sherman Oaks" the short-lived series was ahead of its time -- particularly in that it poked fun at reality shows, which in the mid 90s did not out-number traditional TV programming. A hilarious protrayal of an ordinary S.O. family (in demographic terms) but with all the quirks of several families (including mine) rolled into one. @HippieC- Thank you dear, I'm not crazy then. Well, in this case. The show existed, wasn't a fever dream! Yes, I just remember enjoying it, a few laffs and an endearingly nutty take. I forgot that it was a faux reality show! 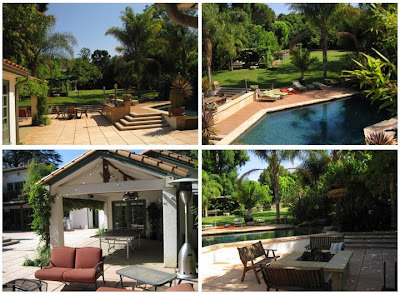 Anyway, whenever I read about Sherman Oaks, I think of "Sherman Oaks" and oh the shenanigans..
nice - i love this property though - the video showcasing it is wonderful! I agree with the Aussie..
HIDEOUS. Knock the house down and build something else.